Thiruvannamalai Temple, in Tamil Nadu, is one of the four sacred places for obtaining salvation, as mentioned in the Siva Purana. Lord Shiva is worshiped here in the form of fire. 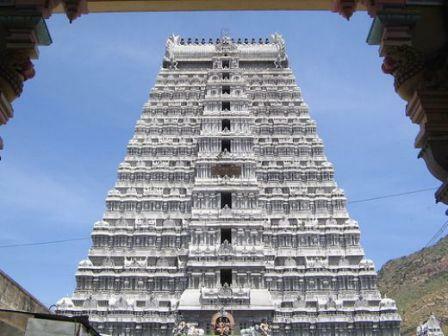 Thiruvannamalai Arunachaleswarar Temple is one of the Pancha Bootha Sthalangal representing the fire element. 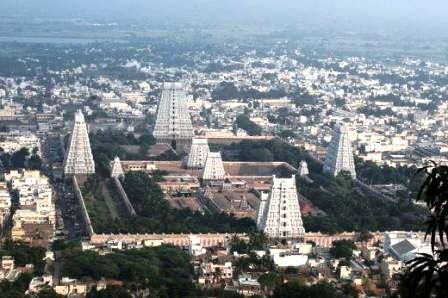 The other temples are Chidambaram, Sri Kalahasti,Thiruvanaikoil and Kanchipuram representing sky,air, water and earth, respectively. Located at the foot hill of Annamalai hill, with great walking path around, on Villupuram - Katpadi Railroad, this ancient temple is believed to have built around 750 A.D, and hence Lord Shiva is known as Annamalayar in the form of Lingam and Goddess Parvathi known as Apitakuchambal. Going around the hill is known as Girivalam or Giripradhakshana. The devotees, both young and old, who come to this temple go on Girivalam at least one time to get the blessings of the Lord. It is believed that doing Girivalam on full moon days and during Tiruvannamalai deepam day (Karthigai Deepam) is more beneficial. The architecture of Thiruvannamalai temple is simply amazing. The temple has six prakarams. Each of the prakarams has a huge Nandi and several towers. The temple has four massive gopuramas - Thirumanjana gopuram, Ammaniammal gopuram, Pei gopuram and the Rajagopuram, thousand pillar hall and a thousand pillared mandapam, a holy tank called Shiv Ganga tank,an underground chamber known as the Pathala lingam chamber with Shiva Lingam shrine, Kambattu Elayanar Sannathi built by King Krishna Devarayar. The eastern gopuram is the main entrance to the temple inside, and the innermost shrine opens to the east and accommodates the main deity,Lord Shiva. It is believed that Lord Shiva manifested Himself in the form of a column of fire which for the sake of mankind. He later transformed into the sacred Hill Arunachala, and that is the reason the hill is still worshipped as a manifestation of Shiva and the Karthikai Deepam Festival has been held from time immemorial to commemorate this event. Many poets like Arunagirinathar, Sambandar, Sundarar, Appar,Shri Muthuswamy Dikshitar and Manickavasagar glorified Lord Arunachaleswarar at Tiruvannamalai and even today their work are regarded to be immortal and unparalleled master pieces. Karthigai Deepam, the main festival, is celebrated for 10 days. Large gatherings of people attend this famous festival. (Nov-Dec) On the tenth day evening,a huge lamp is lit in a cauldron with three tons of ghee at the top of the Annamalai hill. The devotees circumambulate the Arunachala hill by barefoot covering a distance of 14 kms. Four Brahmotsavams are also celebrated every year. Childless devotees hang boon cradles made of cloth to the branches of Mahizha Tree stood at the southern side of third prakaram, with great reverence to Lord Arunachaleswarar. Gingee Fort - Built in 13th century by the Chola dynasty, Gingee Fort is located 37 kms away. Melmalayanur is the abode for Angalaparameswari, which is also very famous. Every new moon day this temple is thronged by thousands of devotees to seek the blessings of the Goddess Parvathi. Sathanur Dam was built cross the Pennaiyar river in the year 1958, is a magnificent structure, near the Chennakeshava hills in Chengam district. A charming children's park and a small zoo also add to its picturesque beauty. Javadhu Hills is 75 kms away. Some exotic places like Kavalur Observatory, Glass house, Kovutteri lake and Beema falls are there. Paadu Veedu is 35 kms away where many temples and some structures that are said to symbolize the remaining parts of a 13th century palace built by Chola kings are seen. Ramana Marishi Ashram - An Ashram of Saint Ramana Maharishi, one of the great saints who lived here, is located on the Arunachala hill. The temple authorities provide simple accommodation at nominal cost. Distance from Chennai - 180 kms; 60 kms from Villupuram; 90 kms from Katpadi; 100 kms from Krishnagiri. The nearest airport is at Chennai 195 km.